Visit Lastovo, an archipelago of 46 islands, if you want to experience the unique beauty of the Adriatic, its diversity, tranquility, crystal clear sea and ever green vegetation. All these small islands have preserved their nature and are an ideal place for a holiday. With Mljet, Lastovo is the greenest Croatian island with over 70% of the forested area. In 2007. Lastovo archipelago was declared a natural park. Island Lastovo is one of the 10 paradises of the Mediterranean gardens that are on the list of the World circulation for Nature (WWF). - Lastovo islands is an ideal place for sailing, water skiing, fishing and spearfishing. - The island is rich with local wine, olive oil, fruit and vegetables, and you can buy fish from local fishermans. - In Lastovo archipelago are organizing diving in a very attractive location. 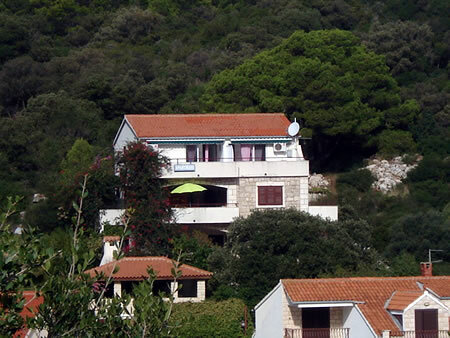 APARTMENT PARADISE are located in the beautiful Mediterranean house in the bay Pasadur on the island Lastovo. The house is owned by family Džanko. It is located 30 meters from the sea and 100 meters from the beach and the restaurant. - We offer accommodation in 5 fully equipped apartments. - At your disposal is a summer veranda with barbecue. - Possibility to rent a boat, bike, scooter, quad, car. - Free parking and mooring for the boat are available. Be our guests this summer and You'll surely come again!